If I had not the faintest idea of the country where we live today and, above all, what kind of people are governing, I would almost always see news as hoaxes. In other words, instead of a state whose image is daily degraded by his so-called leaders, we would live in a nation led by a band of wags, dedicated to do everything to give a laugh to the people. So, abroad people would say: Italy, what a friendly country, where the joy rules and the jokes go around. The problem is that the fact I read this morning does not seem to be a joke: Berlusconi’s People of Freedom are preparing a manifestation for 13 February 2011 against the judges who are guilty of attacking Silvio Berlusconi. Look, I sincerely hope that this may soon be denied, otherwise, once such a joke will travel around the world, a hard to forget in the near future laughing will rise up. However, regardless of whether the grotesque initiative will be confirmed or not, I went around the web in search of the first signers. 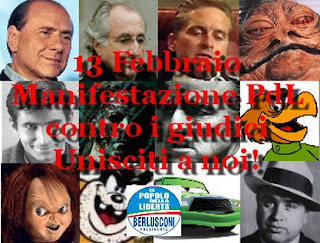 The News: Berlusconi leads the PDL in the streets against the judges, Feb. 13.